Edinburgh offers a fantastic base from which to experience Scotland's world renowned golf courses, while enjoying a visit to the historic capital. Scotland is truly a golfer's paradise, with its excellent golf courses set amid beautiful scenery, well facilitated clubs and the famous friendly Scottish hospitality. In recent years, the sport has grown in profile as celebrities such as Madonna, Catherine Zeta Jones and Brad Pitt have all been snapped playing the game. Scots, however, have always been fond of this exciting, yet relaxing, and above all sociable game. In Scotland, golf provides a social bonding experience for families, school groups and business contacts alike. One of the most centrally located golf courses is Merchants of Edinburgh, with views of the famous volcano Arthur's Seat, Edinburgh Castle and the Pentland Hills. Edinburgh's oldest active golf course is Mortonhall. Public golf courses include Braid Hills, Craigentinny, Carrick Knowe, Portobello, Silverknowes and Princes. Edinburgh has the enviable position of being in close proximity to the surrounding rural areas, not least the breathtaking rolling countryside of East Lothian, home to some of Scotland's finest golf courses. Musselburgh Golf Course, which is easily accessed from the Edinburgh bypass, dates back to 1672 and it is widely believed Mary Queen of Scots played there. 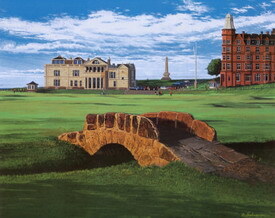 Edinburgh is also well placed for access to St Andrews Golf Course and North Berwick Golf Course. Your golf trip can incorporate time to soak up the history, culture, shopping and dining of Edinburgh. The city is also a great base for groups which may include partners or friends who are less enthusiastic about the game! While you play golf with friends, non-players can also have a wonderful time enjoying all that Edinburgh as to offer. There is a wealth of Edinburgh accommodation to choose from, including high quality apartments. Serviced apartments in Edinburgh are ideal for friends travelling for a golf holiday. After a day out on the course breathing Scotland's enviable fresh air, take to the city's bars or restaurants, where you can be in easy walking distance of your Edinburgh apartments. Novice or seasoned golfer, your Scottish golf holiday based in Edinburgh promises to be an unforgettable experience. About the Author - My name is Xavi Smith and I love to write about the city of Edinburgh and Scotland. If you are also interested in tips about Edinburgh accommodation or Edinburgh apartments , don't hesitate to get in contact.